Is That For Me?? | Jump for Joy! When our daughter was a little girl, my husband and I enjoyed playing Santa, the Easter Bunny, the Tooth Fairy, etc. It was fun to collect gifts and surprise her on a given day. Part of the “game” was that she not know the gifts came from Mom and Dad. An enduring family story centers around the time we bought her a Power Racer for Easter. It required much assembly. My husband and I ended up in the driveway late at night, putting it together by the light of a flashlight. As we reveled in our success at completing the job without awakening our daughter (or getting shot by neighbors who thought someone was breaking into our house), we discovered the one thing we had overlooked. It was battery powered. The large battery had to be charged overnight for it to work. We decided the best place to charge it was in the back bedroom. Our house was very small. As we quietly rolled it down the narrow hall, past our daughter’s room, she woke up. Coming into the hall, rubbing her eyes in wonder, she uttered the words that would stick for years. In my most authoritarian Mom voice, I said, “You’re dreaming. Go back to bed!” And our wonderfully obedient daughter did so. However, in her waking moments, she knew that what she saw had to be more than a dream. She somehow sensed it was there somewhere and it was indeed a gift for her. She continued to look until she found it. Soon the Christmas season will be in full swing. Many of us will spend much time searching for the perfect gift for those we love. When we find something we believe they will like, we will anticipate their delight in receiving it. Giving and receiving the perfect gift creates a Bond of Joy between the giver and the recipient! The reading of the Biblical Christmas Story often brings forth our desire to give a gift to the baby Jesus. But what can can we get for the One Who truly has everything? We may try to get closer to Jesus by praying more or reading the Bible. During the season, we may be more intentional in our giving to others. We may try to be kinder, gentler, or even a little more cheerful than usual. However, as the designated Christmas season seems to get longer and longer, we may have trouble continuing to be “good.” And after Christmas … well … we may be glad it’s over. You may have experienced the “Christmas fizzle,” as I did one year. In spite of all my best efforts to give gifts to the baby Jesus, I was just “over it.” I could not muster any “merry” for another season. In fact, I felt so un-merry that I really resented everyone and everything around me that insisted I be merry! It was true our daughter was all grown up and we didn’t play the “game” any more. But surely Christmas was not something one could outgrow … or was it? I took the bold step of asking the Lord if one could outgrow Christmas. After I asked, I almost went into hiding, waiting for the lightning bolts! But much to my relief, He didn’t strike me down. He reminded me that on each of our birthdays, we celebrate who we are now. We don’t try to stuff ourselves back into the baby body and coo all over again. We remember how far we have come since we were babies and we celebrate all the ways God has blessed us in the fullness of the time we have had on the earth. The Biggest Birthday Bash Ever! He chuckled. Frankly, I didn’t see anything funny about the way He exited earth. I was a little daring into getting into this conversation. I decided to be a little more bold. I imagined the soldiers later, wiping Jesus’ Blood from their hands and hearing the Words He spoke concerning them. I imagined those soldiers in their bed at night, seeing Jesus’ Arms open wide to them. I wondered what they thought then. Jesus interrupted my pondering by a gentle tug. He was speaking to me. I love the way He says my name. It sounds like music being played on some instrument I seem to have heard, but can’t quite remember. I felt as if a door had just opened and a Mighty Wind was blowing through me! The Wind was Gentle and Powerful all at the same time. It seemed to pierce through my outer skin to the very insides of me. Every cell in my body jumped to attention, as soldiers, who recognize that their Commanding Officer has come into their presence. The Wind picked me up and placed me on a higher place than I had ever been before. Everything I believed about Jesus seemed too small. Every tradition I had ever learned was brushed aside in an instant. No day or season or even a lifetime could hold all that He was now! He was indeed Lord of the Universe! I lost all sense of time and space. There was only Jesus and me, locked in an eternal embrace. And then He spoke again. Surprise! The Party’s For You! “You celebrate me?” I was overwhelmed. He will take great delight in you! He will will rejoice over you with singing! but the same Spirit distributes them. Now He really laughed, a long, Melodious Laugh that seemed to fill the Universe. When I opened that box, there was another box inside it … and another inside that one … and … and … on and on. I’m still opening boxes! Much to my surprise, one of the boxes held the words of my wandering (and wondering) thoughts and Jesus’ Answers. 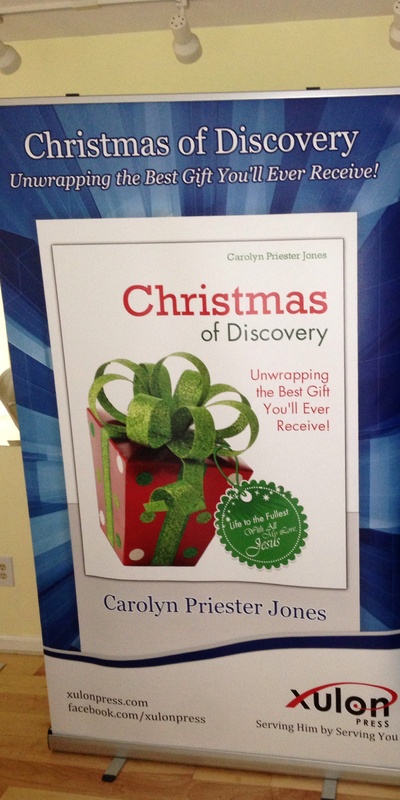 When I followed His Instructions, we wrote a book, called Christmas of Discovery. It was published in August, 2012 and literally made its way around the world. Watch the short video for your invitation to a Christmas of Discovery! If you would like to help spread real Tidings of Great Joy, you can help by forwarding this post and/or link to the book web site to everyone on your contact list. I am already imagining His Stars shining all over the world! When you have a glimpse of something so fleeting it seems like a dream, go ahead … ask The Lord … “Is that for me?” Sometimes He will ask you to wait and sometimes He will put it in your hand right now! Jesus was actually very plain spoken about the Gift He came to bring. I have come that they may have Life and have it to the full! Note: He came to bring you Life … not plain old life … but LIFE to the Full! You will have fun opening that Gift, but once you take it out of the box, don’t try to put it back in. It will never fit back in any box again! Unwrapping the Best Gift You’ll Ever Receive! Posted by carolynpriesterjones on October 19, 2013 in Christian, Encouragement, Joy and tagged Box, Christian, Christmas, Christmas Story, Daughter, Discovery, Encouragement, Fizzle, Gifts, god, Holy Spirit, Jesus, Joy, The Perfect Gift, Wind.